Are you as happy that it’s Saturday as I am? I mean, we’ve been waiting for it all week, right?!?! And now that it’s here, what are you doing? Are you headed to the river, lake, or ocean to soak up some sun and cool off in the water? Or vegging on the couch enjoying not having to be at work? Maybe chasing after kids or toting them to various kiddie sporting events? Working in the yard or garden? So many fun things to do on the weekend, and only two days to do it. Such a shame. I think we should have 3 day weekends all.the.time. Wouldn’t you agree?? Whatever fun, or relaxing, thing you’re doing this weekend you still have to eat, right? And if you’re busy having fun or being productive, you probably don’t want to spend a lot of time in the kitchen cooking when you could be doing other things. 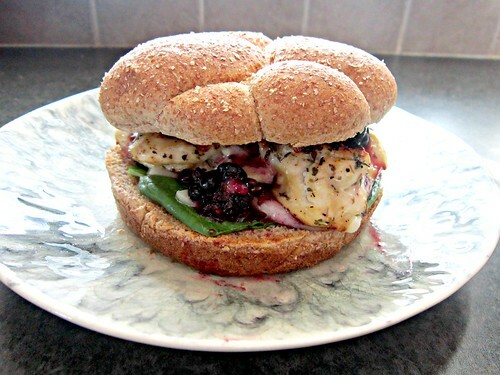 I’m all about quick meals, if you hadn’t noticed yet, and these little chicken sammiches are definitely one of those. Depending on what you opt to serve as a side dish (sweet potato fries take about half an hour to bake) you could have these babies on the table in less than 20 minutes. Hell, less than 15, even! That’s pretty perfect for a weekend lunch (or even a weeknight dinner) and the whole family will love it. I’ll admit I was a little unsure about the brie at first. It’s one of those cheeses that people either love or hate, in most cases. I’m a little abnormal when it comes to cheese. There are some that I never like (blue, gorgonzola, etc. ), some that I always love (cheddar, Gouda, all the mild cheeses), and then some that it just depends what it’s with…brie and goat cheese being some of those. I love some baked brie with fruit and crackers, but on it’s own, just to take a bit of it…not such a fan. Blackberries, however are my very favorite berry so I wanted to give it a try. I probably put a little too much brie on my sandwich, so it was a little overwhelming for me at first, but the combination of all the components worked out really well. J was having something else for dinner that night and thought my sammich sounded weird, but he tried a bite anyway. And then he went and made one for himself. So, yeah. It’s good, even if it sounds weird to some! In a small bowl, combine the blackberries, red wine vinegar, olive oil, honey, and thyme leaves. Season lightly with salt and pepper. Stir well to combine, and mash lightly with a fork to break down the blackberries just a bit, but leave mostly whole. Set aside until ready to use. Butterfly the chicken breasts to create 2 separate, thinner, halves per breast. Season both sides of the chicken with salt, pepper, and a little bit of Herbes de Provence. Heat a skillet or grill pan over medium high heat, place a small amount of olive oil or cooking spray on the bottom, and cook for 2-3 minutes per side or until cooked through. 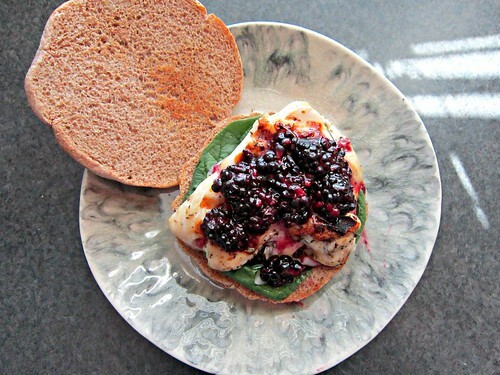 To assemble sammiches, warm or toast your buns, then place a few spinach leaves on the bottom bun, top with a few slices of brie, a chicken breast half, and then a couple spoonfuls of the blackberry sauce, and the top bun. 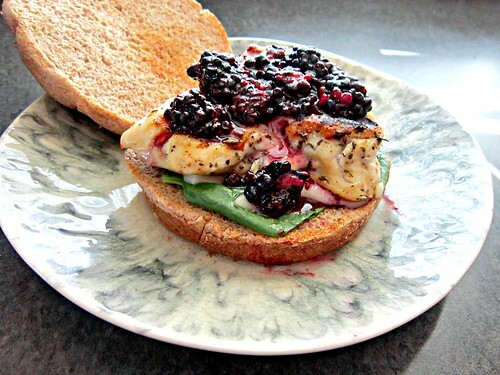 The warm buns and chicken will make the brie melty and delicious!